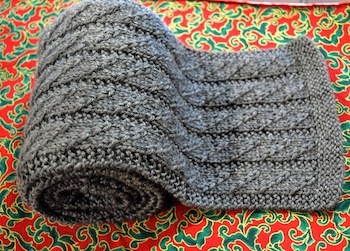 Many beginners start their first project with scarf because it's not too complicated to knit. If this is your first scarf, try the simple one like rib scarf or summer scarf which don't require a lot of concentration. I also listed other shawls and neckwear such as neck warmer and cowl. I love all of these scarfs and I think you'll will too. All of them are very easy to knit. Some of them require more concentration than the others. But all in all I think you can easily knit them. I will gradually add more patterns when I find one I like. 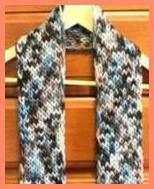 A perfect scarf for him - Handsome wool scarf in cross over stitch pattern. Knit without cable needle but gives you a nice cable effect. This scarf is fit for a prince. Elegant Eyelet Cowl Impressed your friends with this beautiful cowl during this Holiday season. This scarf knit up fast! You can keep it as a long scarf or turn it into double loops cowl. 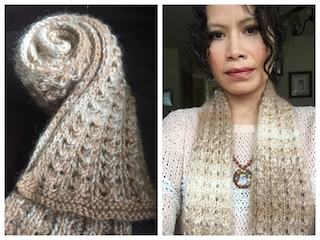 Make this love alpaca and wool scarf just in time for a cold Winter. Love this natural, undyed baby wool and baby alpaca. The work very well together. I can wear this anywhere I go now! With Video Tutorial Bonus! 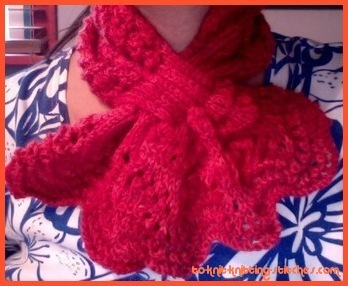 Sweet Valentine Cowl Fast and not complicated to make. Make it for your love one for this Valentine! Emerald Shoulder Shrug/cowl Beautiful shoulder shrug to wear around your shoulder or neck as a cowl. This shrug feature an eye-catching diamond edging. 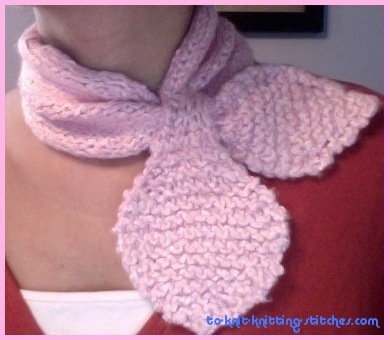 Pretty-in-pink Scarf - This easy to knit scarf is surely will melt your heart. Make one for your daughter and friend. It's fun and simple. Lunar Azul Scarf - Challenge yourself to make this scarf with lace, ribbing and keyhole. It's bulky and fast to knit. One of my favorite scarves. Happy New Year Scarf - Going out to a party? This scarf will make an eye-catching entrance. 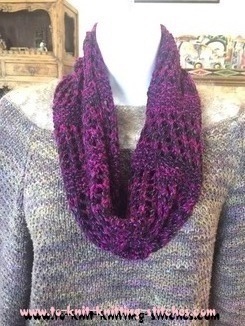 Fast and easy to knit and great for gifts too! Accidental Cowl Cute little lacy cowl knitted with light weight yarn from Caron. It has double rib lace pattern on the body and rib pattern on each ends. It requires two buttons to hold piece together. Triangle Shawl With Lacy Edge - This colorful shawl will make a great winter project. If you like a big shawl with along wing span, this is the one for you. This is a perfect gift for Christmas. This one is on its way to my friend. This scarf is perfect for Summer outing but not limit to other seasons. Try knitting this light weight hand-dyed cotton/bamboo yarns alternated with kid mohair and you'll fall in love with the gentle feel of it. 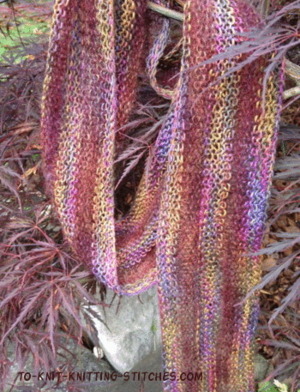 Here is another popular potato chip scarf by Knitpick. It's smaller version than the top one. Knitted with so soft bamboo blend yarn from Bernat. Great for a gift! Have a ball of yarn laying around and don't know what to do with it. Here is a one ball yarn project you can knit in a few day. This scarf is so easy to knit with simple stockinette stitch. If you're beginner, you definitely should try knitting this crazy eyelash yarn at lease once. Submitted by Lisa Savage of Quebec. This is a nice and easy scarf to knit. 1x1 ribbing gives the scarf a clean and sleek look. It's a good way to show off your pretty yarn. This beautiful lacy scarf is knitted with luxurious "Fiesta La Boheme Yarn" that I found hard to resist. Love the yarn and the finished scarf. Great gift for anyone. Big and beautiful chevron scarf. This big fluffy and furry scarf is knitted in chevron and feather stitches. 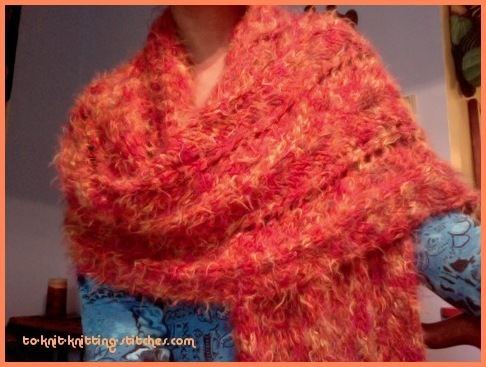 It's a fun and fast scarf to knit because of the bulky yarn. Perfect for beginners who wants to move to the next level. It's more than just a scarf! Another pretty lace scarf I love. If you want a scarf that give you a breeze, try this one. Mistake Stitch Scarf - Simple but yet very elegant. 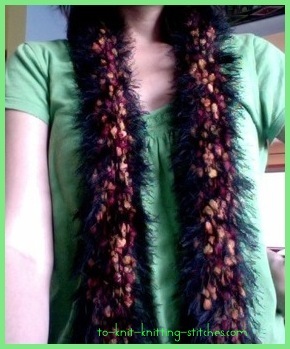 Lovely Leaf Lace Scarf - This is one of my favorite scarfs. Love the leave pattern! 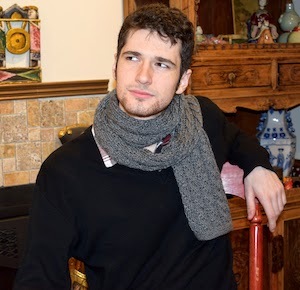 New York Scarf – A Guy Woolie's Warmer - Try knit this one for your guy. It'll definitely warm his heart too or maybe melt it! 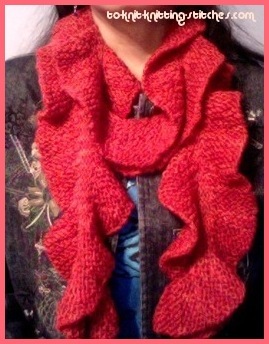 Knit Along Scarfs! 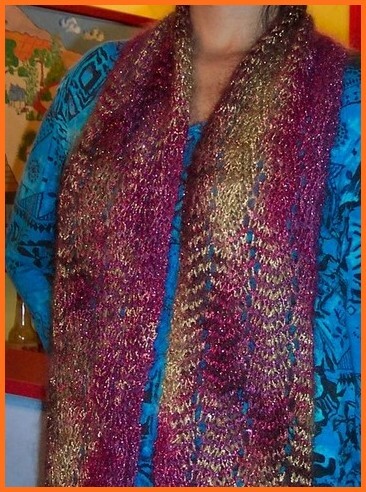 - Many free patterns of scarfs and shawls. Knit along instructions provided. This scarf pattern is perfect for spring and fall project. 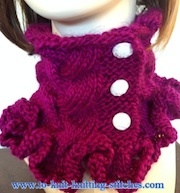 The feather and fan pattern gives it a wavy look and lacy knit. Use combination of bright colors to create a cool look for kids and teens. In Northeastern Thailand, each man usually carries his personal multi-purpose piece of long cloth with him. Sometimes, he ties it to his waist, lays over his shoulder, wraps around his neck or tie it to his head. He would use it for every thing such as protect his head from the sun, wipe off sweat or dry off after shower. When in need for a carrier, he can use it to wrap up stuff to carry it home.